Of the five bank headquarters Summers listed as visible from that intersection, only one remains in business 36 years later. 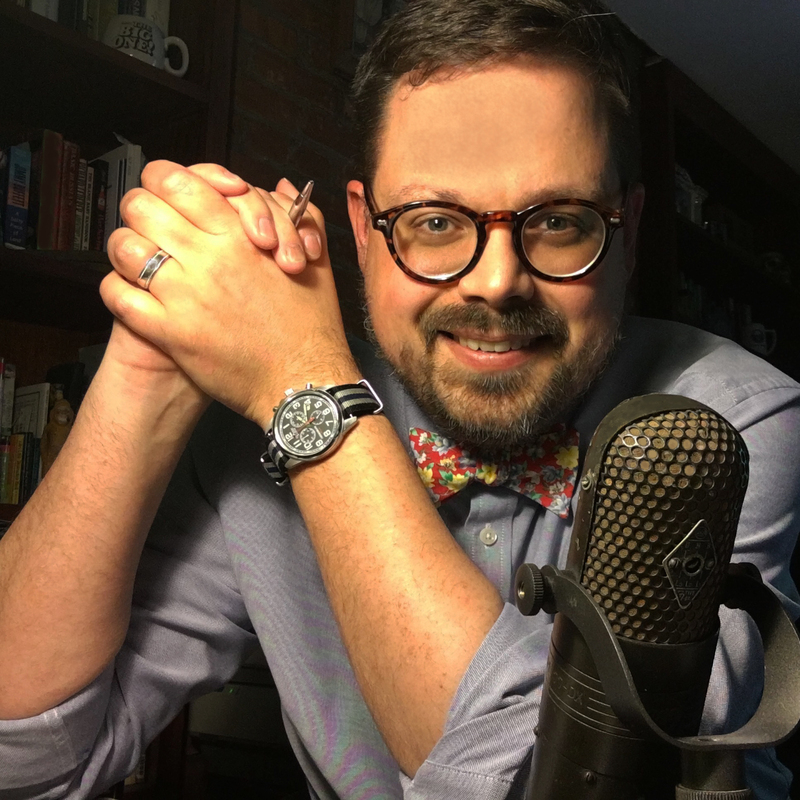 As the names involved in Buffalo’s banking scene are changing once again, BN Chronicles looks back at the names that might have been stamped on the front of your first savings account passbook or at the top of your first paycheck. 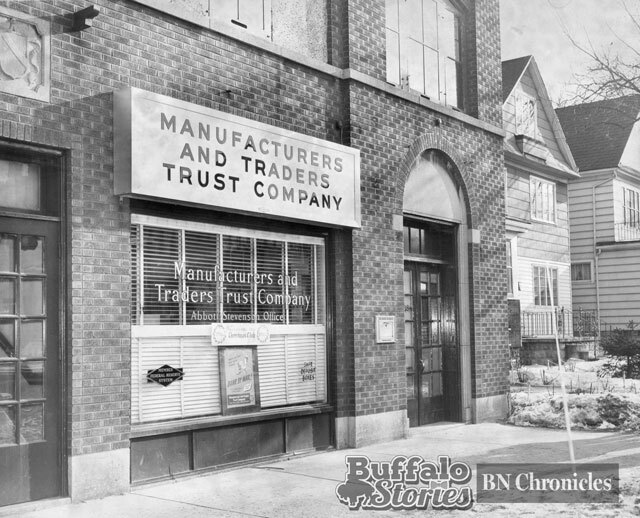 Manufacturers and Traders Trust Company was founded in Buffalo in 1856. M&T was and is headquartered in the 318-foot, 21-floor building at One M&T Plaza that opened in 1966. That block has seen plenty of history. In 1865, Abraham Lincoln’s body laid in state at the St. James Hotel on the site. 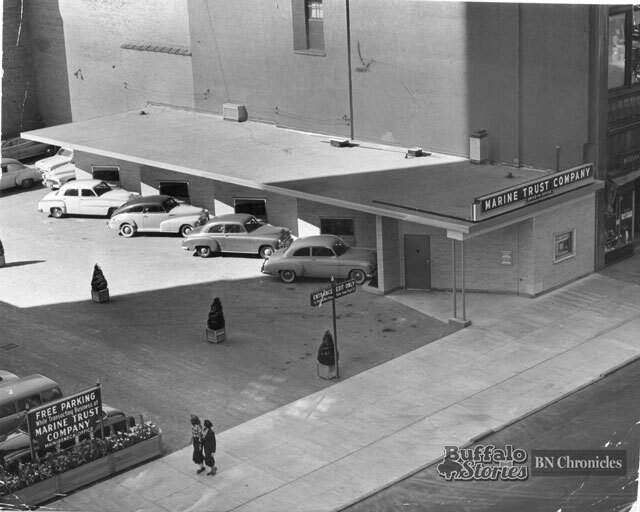 The Hotel Iroquois, and then the Bond Men’s store, occupied the north part of the site until 1964. M&T’s headquarters was first built on the southern half of the block now occupied by the headquarters building in 1916. In 1980, Marine Midland Bank was Buffalo’s oldest bank and headquartered in Buffalo’s tallest building. Founded in 1850, Marine Midland was the nation’s 12th largest bank with $12 billion in assets in 1980. It was acquired by HSBC Bank in 1999. HSBC sold off its Buffalo-area branches to First Niagara in 2011. By the end of the summer, it’s expected that First Niagara will be acquired by KeyBank. The former Marine Midland Center is now known as One Seneca Tower. Western Savings Bank’s headquarters was right on the corner that Summers chose as his 1980 vantage point for financial institutions. It’s the building with CVS Pharmacy currently occupying the ground floor space that was once Western’s main office. 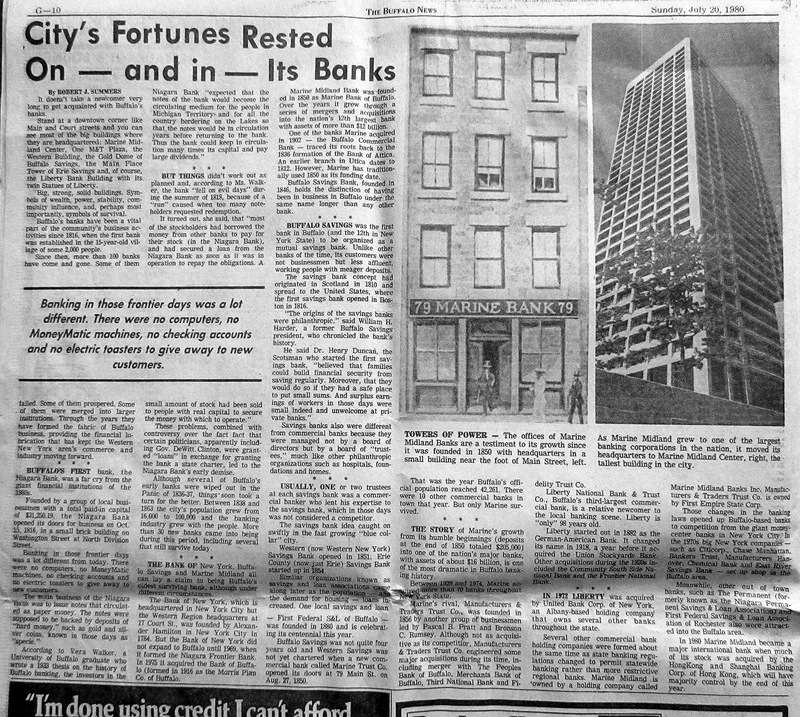 While Western joined other area banks in demolishing decades-old Roman-inspired headquarters buildings for flashy new high-rise towers in the 1960s, by the early 1980s, deposits were falling and Western was losing money. 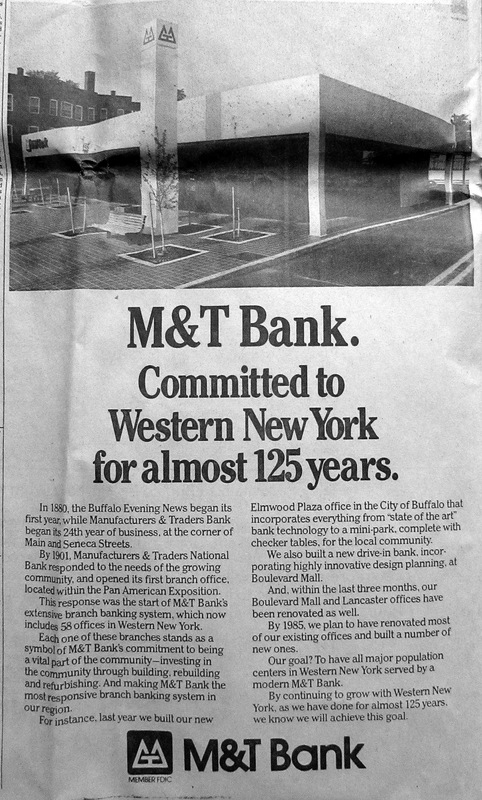 In 1981, Western merged with longtime rival Buffalo Savings Bank. 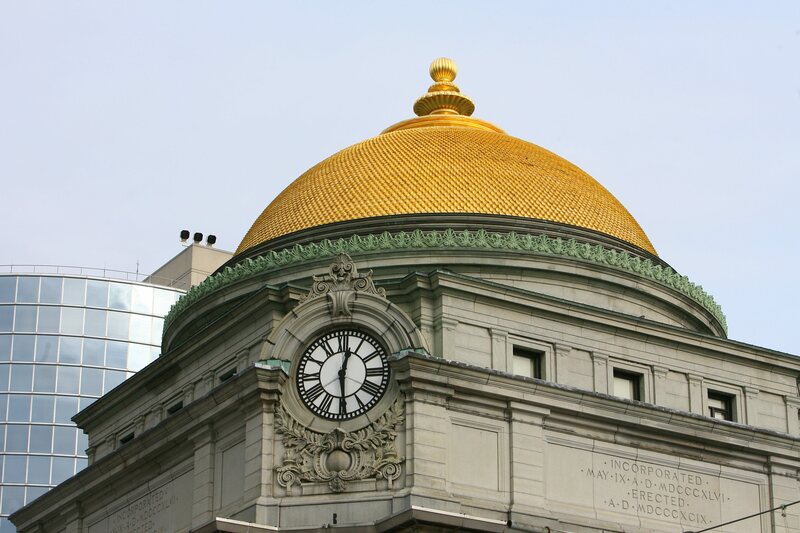 Buffalo Savings Bank’s famous gold-domed headquarters, designed by E.B. Green, is the rare survivor of our city’s magnificent bank buildings. 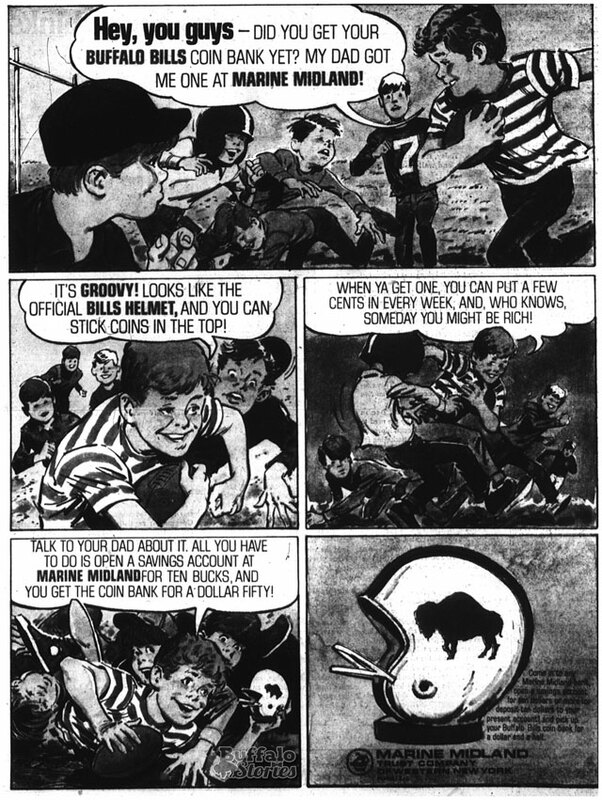 As it expanded and acquired outside of Buffalo, Buffalo Savings Bank changed its name to Goldome — as a nod to its great headquarters with a name a bit less parochial sounding. Like many banking institutions around the country, Goldome grew too quickly and went under during the savings and loan crisis of the late 1980s. In 1991, Goldome’s assets were split between KeyBank — which entered the Buffalo market after Empire of America succumbed to the S&L crisis — and another bank in 1989. 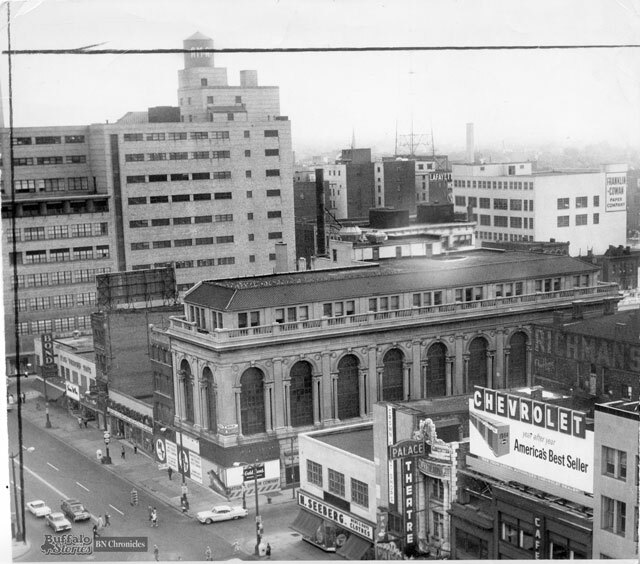 For the same reasons Buffalo Savings Bank became Goldome, “The Big E” changed its name from Erie County Savings Bank to Empire of America in 1981. After nearly a decade of borrowing to acquire other banks around the country, in 1989 Empire told regulators it was insolvent and posted a $158 million loss in the third quarter. 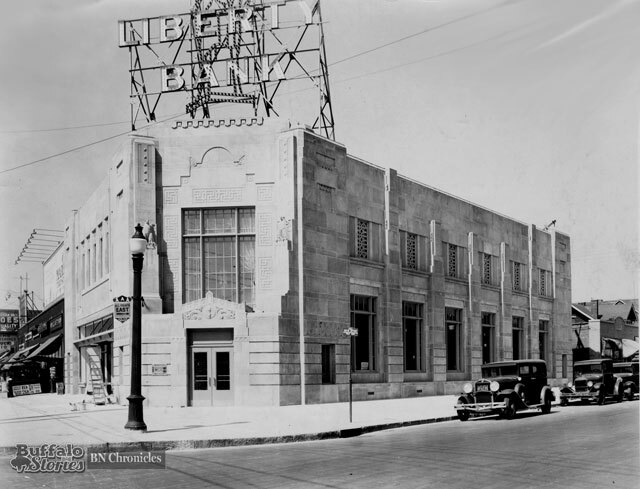 As longtime Buffalo banks Buffalo Savings and Big E were busy buying up other deposit bases, longtime Buffalo institution Liberty Bank instead was bought up. While the twin Lady Liberties atop the bank’s headquarters still stand proudly on Buffalo’s skyline, in 1985 Liberty Bank became Liberty Norstar. Boston’s Fleet Bank bought Norstar in 1987, and in 2004, all Fleet branches became Bank of America branches after those two institutions had merged. Thirty-five years ago this month, The News began celebrating the 100th anniversary of the paper starting a daily edition. 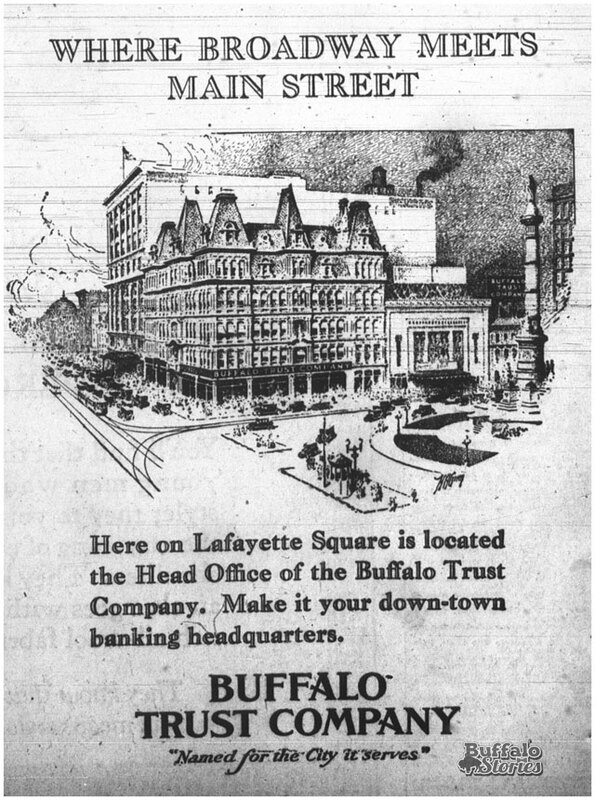 In the special section called One Hundred Years of Finance and Commerce, The News recounted the history of a handful of Buffalo’s financial and commercial industries, and provided ad space for many companies involved in those industries to tout their own contributions. 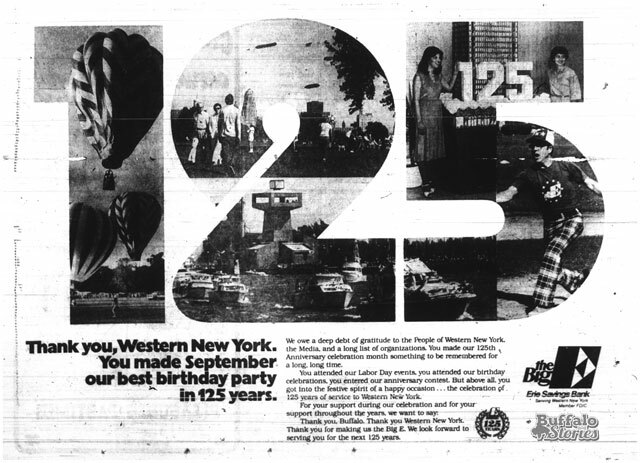 In 1980, many of the big names in Buffalo banking — Marine Midland, M&T, Western, Buffalo Savings, and Liberty — all would have been familiar to Buffalonians 100 years before. Thirty-five years later, only M&T remains. Thirty-five years ago this week, The News began celebrating the 100th anniversary of the paper’s starting a daily edition. 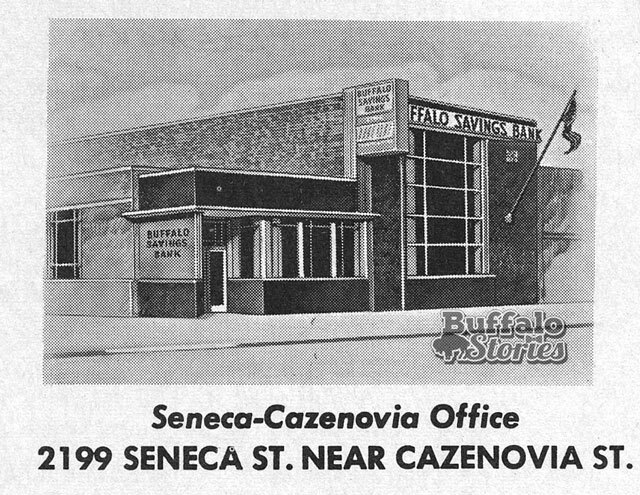 In the special section called One Hundred Years of Finance and Commerce, The News recounted the history of a handful of Buffalo’s financial and commercial industries and provided ad space for many companies involved in those industries to tout their own contributions. 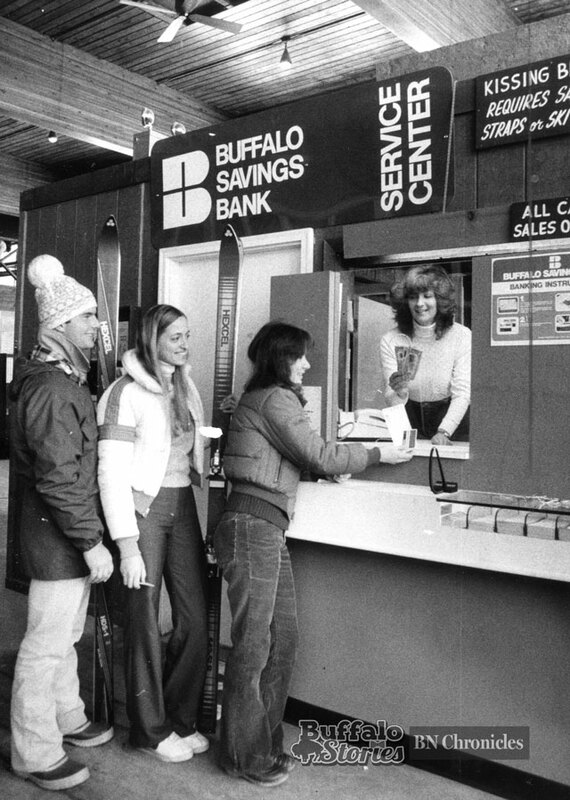 M&T Bank had been keeping Buffalo’s money safe for 24 years by the time The News started its daily editions, but in 1980 the bank was solidly in growth mode — including in the Elmwood Village. It’s easy to laugh at the idea of a mini-park — especially since the same bench and trees on concrete slab stand there today. But in 1980, the idea that a tree might be planted in a spot “where a car could park” likely seemed pretty radical.